The Steelers missed the playoffs for the second straight season last year — the first time they’d done that since 2000 — and finished 8-8. Some season previews are claiming the Steelers were the good kind of 8-8, the kind that finishes the season strong instead of fizzling to .500, as they did the year before. Three of the NFL.com analysts who picked Pittsburgh to win the AFC North this season noted the team’s strong finish. Unfortunately for Pittsburgh, a team that’s the “good” kind of 8-8 probably isn’t any more likely than one that’s the bad kind to do better the next season. For every team like the 1997 Atlanta Falcons — who won six of their last eight to finish 7-9, then went 14-2 in 1998 — there was a counterexample, such as the 1979 Chicago Bears. That Bears team started the year 3-5, finished 10-6, then regressed to 7-9 the following season. There are other reasons to think Pittsburgh will improve on 8-8, such as the arrival of wide receivers Lance Moore and Darrius Heyward-Bey to bolster the passing game. 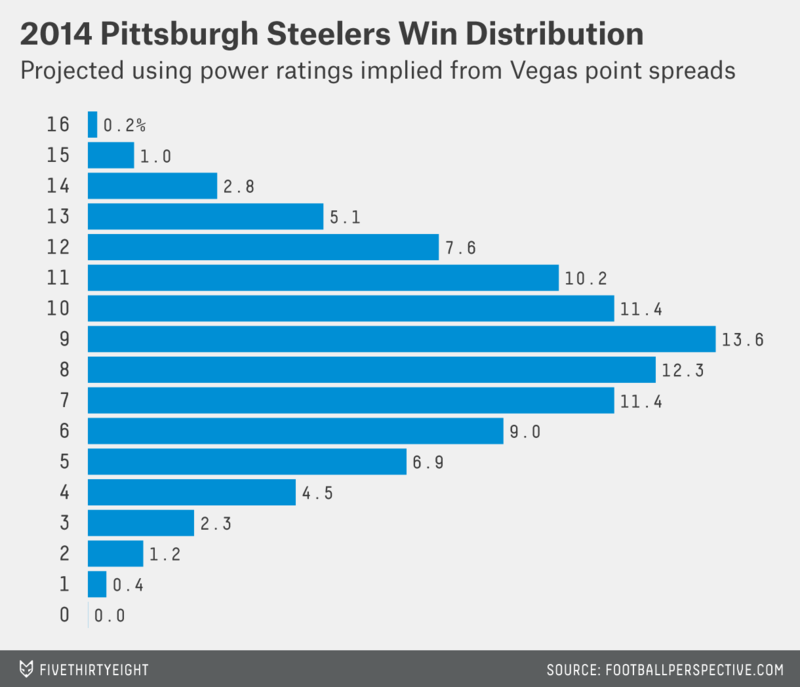 But the timing of the Steelers’ eight wins last year isn’t one of them. To take a chance on the nation’s best collegiate running back, teams used to need a top-five pick in the NFL Draft. These days, it only takes a second-rounder. The Bengals have taken a running back in the second round in each of the last two drafts — UNC’s Giovani Bernard last year and LSU’s Jeremy Hill in May — making them the rare team investing in running backs as those players become more replaceable. The stock of the draft’s top back seems to plummet each year. In 2011, Mark Ingram was the first back chosen when the Saints took him with the 28th pick — the latest the first RB had come off the board in at least half a century. Last year, Bernard, the first RB taken, was picked 37th. And this year, Hill went at 55th — just one pick after the first back chosen, Bishop Sankey, who went to the Tennessee Titans. It’s no wonder Bengals coach Marvin Lewis feels comfortable relying on non-first-round picks to power his rushing game. The two top backs in his first year with the club were Rudi Johnson and Corey Dillon, who were drafted by Cincy in the fourth and second rounds, respectively, yet rank third and first on the franchise rushing yards list. Dillon and Johnson were great finds late in the draft in part because several backs were selected before them. But despite being later picks, Bernard and Hill are still some of the more highly touted backs of their draft classes. In projecting how good they’re going to be, we should make sense of where they stand relative to other running backs in the draft, not where they were selected overall. That doesn’t mean there aren’t still duds, such as Chris Perry, whom the Bengals chose late in the 2004 draft’s first round and who ran for only 606 career NFL yards. 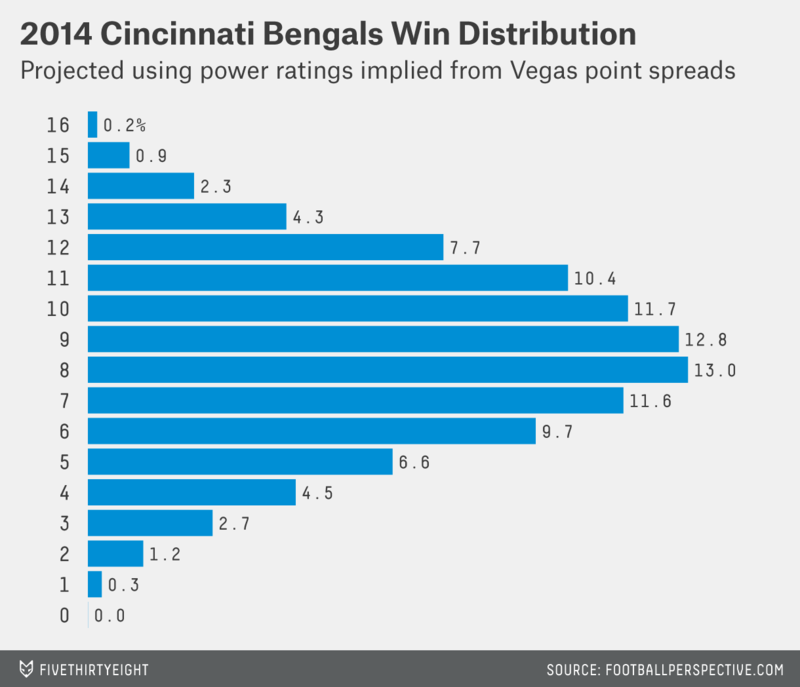 Cincinnati might someday regret either Bernard or Hill, or both, or merely the decision to draft them so close to each other. At least it didn’t have to use a first-round pick. Quarterback Joe Flacco probably isn’t as bad as his stats last year make him look. But he still probably isn’t as good as he looked when he led Baltimore to a Super Bowl title. In early 2013, Flacco had a postseason for the ages, throwing 11 touchdowns, no interceptions and more than 1,140 yards in four games, two of them against top-six passing defenses by adjusted yards per attempt. Then he stumbled through the following regular season, with just one game even approaching the statistical standard he’d set the prior winter. To estimate just how unlikely Flacco’s run was, I started with his adjusted yards per attempt in each game of his career. Then I adjusted that adjusted stat a little more, accounting for home-field advantage and computing his performance relative to the average AY/A allowed by the opposing defense. I found that three of his four games in the 2012 postseason were way above his average level. Two were more than two standard deviations better than his average. In any given game, Flacco had a 1.6 percent chance of putting up numbers that were equivalent to or better than his best game of that postseason. I took the conservative route and figured that each of these three games had a 5 percent chance of happening at any time — about the likelihood Flacco had of performing the way he did in his third-best postseason game. Then I calculated the chance he’d have at least three of those excellent, 1-in-20 games in any particular four-game stretch. It was about one chance in 2,000. That looks really rare. But such a fluky run looks less fluky when we consider all 106 four-game stretches of Flacco’s six-year career. There’s about a 95 percent chance that somewhere in there a quarterback of his standard — above average but not great — would have a four-game stretch with three games well above his average. 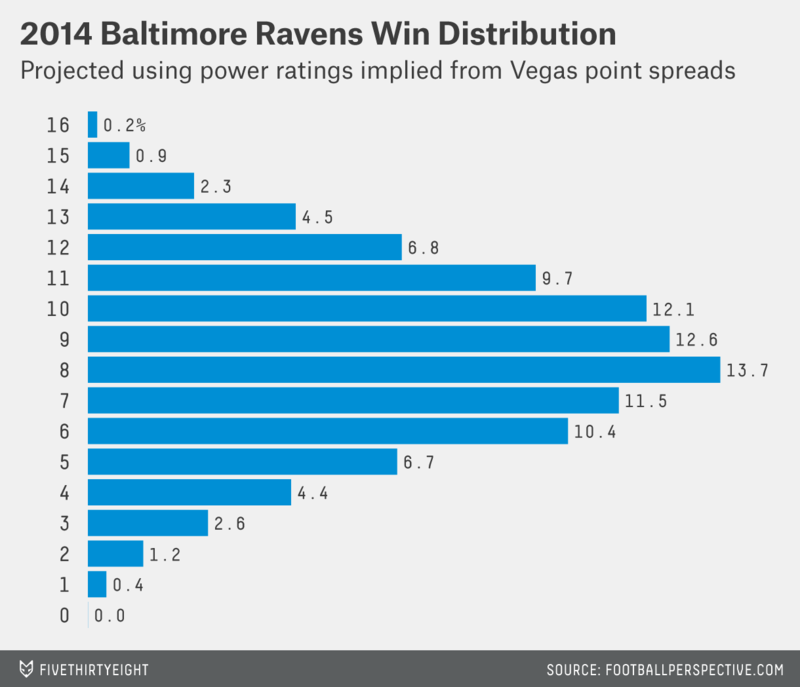 Flacco’s poor 2013 season dragged down the chance he’ll return to that level of brilliance. His most recent four games were each well below, not above, his career averages. He’s unlikely to repeat his Super Bowl-winning transformation into Joe Montana; the Ravens would settle for his transformation back into the solid, above-average Joe Flacco he was before. Josh Gordon was one of very few bright spots for the Browns last year. In just 14 games, the then-22-year-old receiver gained a league-best 1,646 yards and scored nine touchdowns. His receiving yardage was the most any player accumulated in 14 games or fewer since 1961. Even though my colleague Neil Paine showed God doesn’t hate Cleveland, the Browns’ earthly problems continue: Gordon failed several drug tests and is suspended for the whole season. With him goes 41 percent of Cleveland’s receiving yards last year — and any hope the Browns might have held of sneaking out a title in this scrambled division. Or does it? Not all receiving yards are created equal. Traditional stats don’t note when receivers pile up yards because of favorable conditions such as weak opposing defenses, a pass-happy era or a great passer on the roster. FiveThirtyEight contributor Chase Stuart tried to correct for these factors last year at Football Perspective with what he called True Receiving Yards. Using TRY, Gordon’s stats look much more mundane. He gained less than three-quarters of a true yard for every receiving yard in the box score during his two NFL seasons. That’s the lowest ratio for any receiver with at least 1,000 yards in the history of the NFL, which figures since Gordon caught his passes in the passing-friendly present. Less than three-quarters of a yard still sounds better than nothing for a team that didn’t draft a receiver in May. But Gordon’s discounted production still might overstate his value to his club. Did he make his quarterbacks, and Cleveland’s overall passing game, any stronger? Paine also studied that question. His with-or-without-you (WoWY) analysis5 gives extra credit to guys like Randy Moss who turn journeymen quarterbacks into Pro Bowlers. So far, Gordon isn’t helping Cleveland QBs nearly as much as his raw stats suggest. His WoWY score is essentially zero: His quarterbacks have just as high age-adjusted adjusted yards per attempt figures with him as without him. Brandon Weeden wasn’t much worse in last season’s opening two games, in which Gordon didn’t play, than he was when throwing to Gordon over the rest of his career. And Jason Campbell, who’d never before thrown at least 100 passes in a season for a team with a receiver with 1,050 receiving yards, performed below his career average with Gordon last season. One factor that may make Gordon less effective than his raw totals suggest: His catch rate was just 55 percent last year, well below many other leading receivers. With just two seasons under his belt, Gordon may not have generated a large enough data set to get fair treatment from this approach. A season without him may be the opportunity Cleveland’s quarterback — whoever ends up getting most of the starts — needs to demonstrate just how bad he is without Gordon to catch his passes. But we can already say that Gordon hasn’t yet made quarterbacks look better in the box scores. 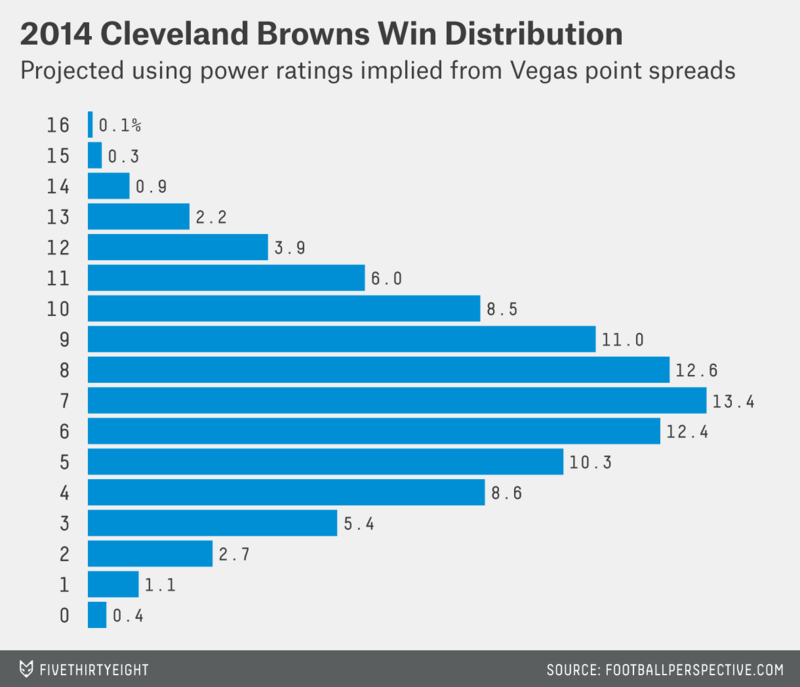 So the Browns probably aren’t cursed. Unfortunately, they’re just not very good, with or without Gordon. In which an NFL team played 16 games in each season, in the same city, with the same name. I cross-referenced two Pro-Football-Reference.com team game finders. I counted ties as half a win, and ran a correlation between: (1) the difference between the team’s first- and second-half wins in Year 1; and (2) the difference between the team’s Year 1 and Year 2 wins. The correlation coefficient was 0.03, essentially zero. I ranked running backs in each draft by where they were picked, and also by Pro Football Reference’s Career Approximate Value. I then compared the two rankings in two ways: by average absolute value of the difference of each back’s two rankings, and by the average ratio of each back’s higher ranking to his lower ranking. By the first measure, drafts have become more predictive of backs’ careers. But that doesn’t account for the decline in the number of backs drafted starting in 1992; fewer backs means fewer possible ranking slots and less divergence in rankings. The average ratio accounts for that and has shown little long-term trend. This calculation assumes he would have played four games in each postseason — that is, if he kept excelling, the Ravens would have kept winning. Sometimes — when Baltimore got a first-round bye — he’d have maxed out at three games, but we’ll assume he could have reached four to simplify the calculation. Which my colleague Ben Morris has used as well; I stand on the shoulders of giants.